O.K., so I’m way behind on the Blog. All year I have managed to stay only a week behind and now at the end of the trip I have fallen behind by about two weeks. We have been on the move and very busy which has left no time to write but now that I have little breather, I will try to get caught up. 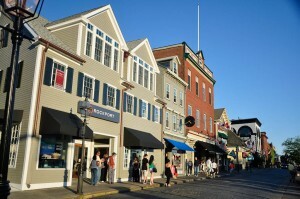 I’ll start with Newport, Rhode Island. 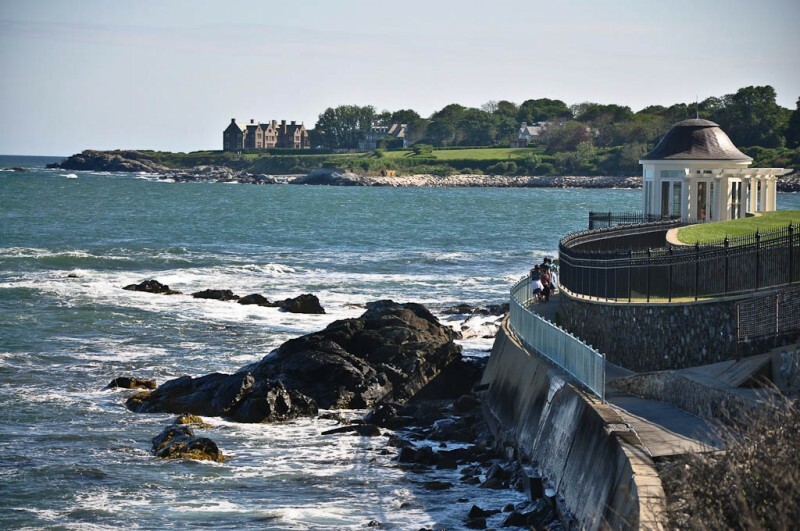 Forbes Magazine recently rated Newport as one of the prettiest towns in America and I have to agree that it is a fair assessment. 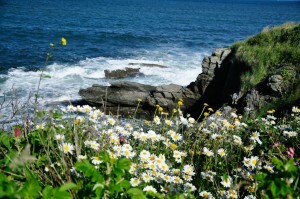 From the rugged coastline to the picturesque harbor; from the stately mansions to the quaint 18th century town, it is really something to see. Settled in 1639, it has had plenty of time to collect a very colorful past. It once was a hub of slave trade and a base of operations for pirates. It was also home to 22 rum distilleries in the late 1700’s. It has evolved over the years and in the late 1800’s it became a summer resort for the elite like the Vanderbilts and Astors. Mansions of the gilded age are a reminder of those days and line Ocean Drive. 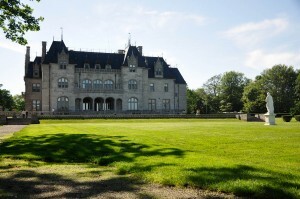 Salve Regina University purchased 9 of the mansions that now house the school and many others are available to tour. The downtown area also has one the highest concentration of colonial homes in the nation, all beautifully preserved too. 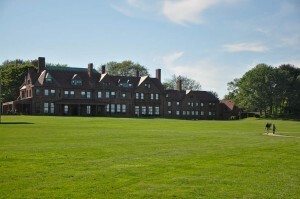 right: One of Salve Regina’s Mansions. 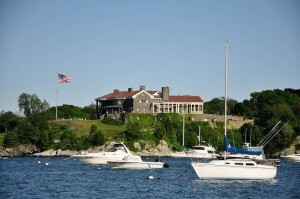 If that isn’t enough to get your interest, President’s Eisenhower and Kennedy used Newport as a summer getaway, the Tennis Hall of Fame is located there, it is home to the famous Newport folk and Jazz Festivals and it is considered the sailing capital of the United States. Sailing is what first introduced me to the town back in the late 1980’s. 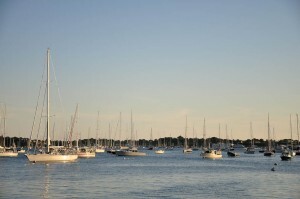 I began sailing on a J24 sailboat with my friend Kim and before long we were spending every weekend in the summer in Newport. 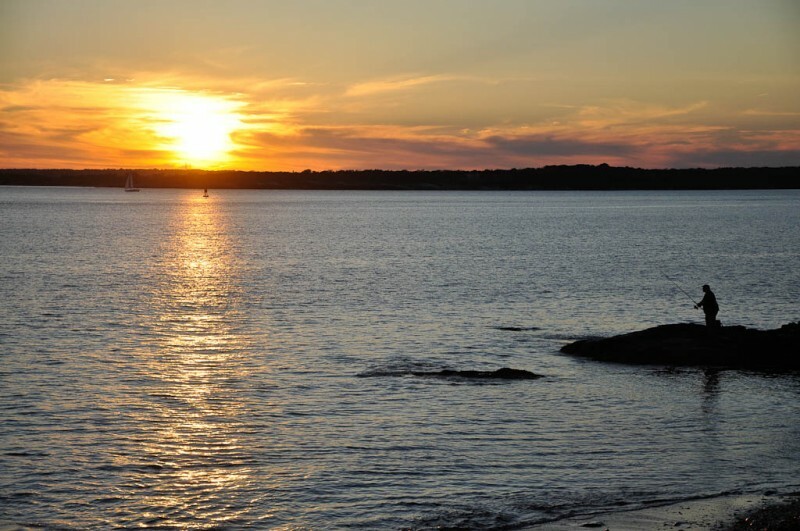 During the sailing season, it became a home away from home with us living on the boat at Fort Adams State Park during multiday Regattas. This was my first time back since my sailing days which ended up being yet another trip down memory lane. 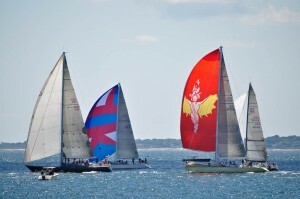 We were fortunate enough to arrive the day before the Newport to Bermuda race in which 183 boats would be heading out to sea. 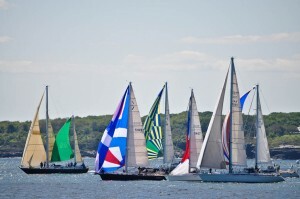 The Hippygeek was originally ho hum about going to Newport but perked up quite a bit when he found out about the race. Then we heard that they were also setting up for America’s Cup racing and he really got excited. Unfortunately we wouldn’t be able to stay long enough to see that. 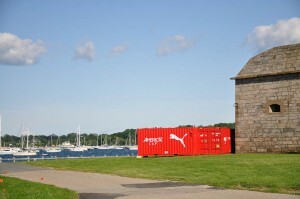 right and below: Shipping containers with America’s Cup boats and supplies. 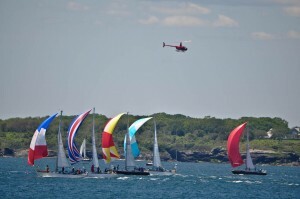 We toured the harbor to oohh and ahhh at all the amazing boats and the next day took a picnic lunch out to Brenton Point to watch the start of the race. Ten to fifteen boats started at a time with ten minutes between starts so we hung out on the point for most of the sunny afternoon. 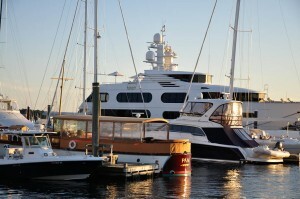 A few years ago, the Hippygeek did a boat delivery from Bermuda to Charleston. The winds seemed to never blow and the trip took ten days. 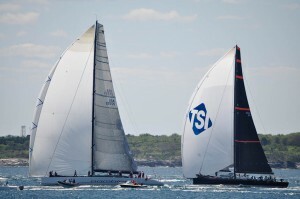 The winds for this race were steady and strong and the winner set a course record of 39 hours! 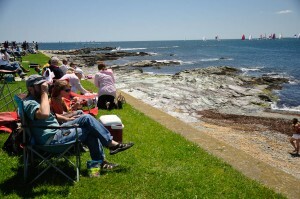 left: Picnicking at Brenton Point during the start of the Bermuda race. 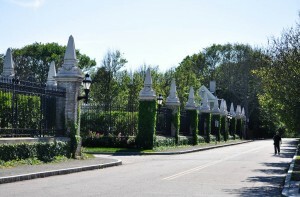 We also took the time to stroll along the Cliff Walk which is a paved walkway passing between the magnificent mansions along Bellevue Avenue and the sea. I can see why the wealthy choose to build their summer homes there. We didn’t tour the inside of any of the homes but I did get a little peek years ago when the banquet for the Women’s World keelboat Championships were held at the Marble House, one the Vanderbilt Mansions. If it wasn’t made of marble, it was covered in gold which isn’t something I could relate to but was jaw dropping just the same. 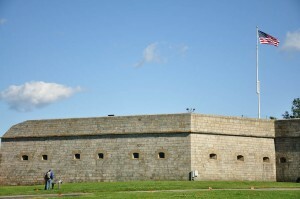 I also took the guys over to Fort Adams State Park where we used to keep our boat to show them yet another place of my past. 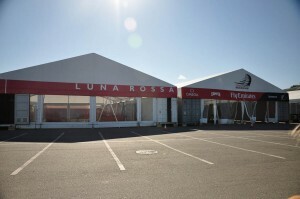 When we arrived, we saw shipping containers that were being unloaded to build an America’s Cup encampment for racing scheduled for the next week and watched as a crew was beginning to assemble on of the boats. We were dissappointed that we wouldn’t be able to stay for the race. 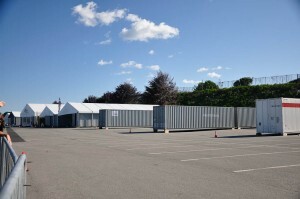 right: Crew tents for the America’s Cup teams. 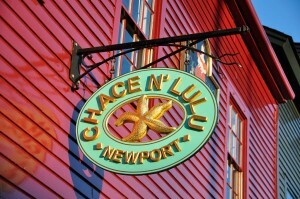 Newport, as usual, was hoppin’ with all kinds of activity that kept us busy and entertained. 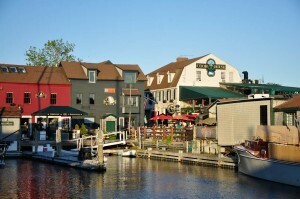 It also reconfirmed, for me, that it is definitely one of the prettiest towns in America. One hundred years after the declaration that all men are created equal, there began to gather in Newport a colony of the rich, determined to show that some Americans were conspicuously more equal than others. 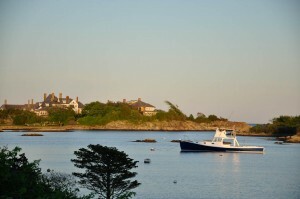 This entry was posted in Dawn Deliberates and tagged Newport. Bookmark the permalink.